In late September, I traveled to Haiti to conduct research on how Haitians engage with financial institutions and mobile technology to explore the feasibility of introducing mobile money as an avenue for the provision of financial services. Together with the team from the USAID/Haiti Finance Inclusive project, implemented by DAI, and with support from our sister USAID/Haiti project Finance Pour Tous and two key credit unions—Caisse Populaire Fraternite (CPF) and Socolavim—I visited nine locations through the northern and central provinces of the country to interview 181 credit union customers as they went about their business. 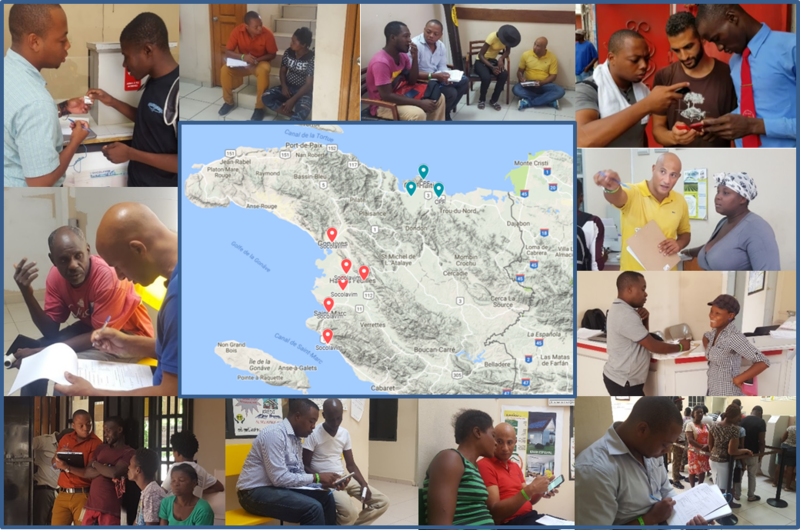 The DAI team interviewed 181 Haitian credit union customers in nine different locations. The process mirrored our Digital Insights work in other countries, but focused specifically on exploring how mobile technology might play a role in overcoming some of the constraints credit union customers face in accessing financial services. The goal was to determine whether mobile technology could be a viable instrument for financial service providers to better serve lower-tier markets. To that end, we targeted credit union customers across multiple locations in Haiti to find out how they interact with financial institutions and mobile technology, and what their attitudes toward potential mobile banking products might be. People still rely largely on traditional media sources (radio and television) for their news, but are active mobile phone users. Ninety-eight percent of interviewees own a mobile phone and 72 percent own smartphones—a surprisingly high number. Haitian credit union customers also proved to be prolific messengers, sending an average of nearly 80 messages using various platforms on their mobile phones per day, with Facebook and WhatsApp dominating the landscape of apps used to communicate. People have a high level of confidence in credit unions as trustworthy financial institutions and are happy with the services they offer, but are also often frustrated with the perceived inefficiencies of some of those services. This offers a significant opportunity for services such as mobile money to save time: the services that people regularly visit their credit union branches for are overwhelmingly simple transactions that could be automated with mobile technology to eliminate the need to travel to credit union branches and wait in long lines. People have a basic awareness of mobile money products and generally have a positive attitude toward the concept. However, their understanding of how mobile money works and how to use it is limited, and a general lack of trust of network operators hinders people from opening mobile money accounts. At first pass, it seemed that a significant number of people don’t see the value in having their own mobile money account. Yet, when we dug into this specific issue, more often than not it turned out that people didn’t really understand what they could do with their own account. Some people even left after our interview only to come back minutes later saying they had given it some thought and they would like us to help them open an account! Furthermore, the value of mobile money for executing remote transactions is undeniable, as we observed that among many of those who don’t have their own mobile money account, people simply used third parties as a workaround to transfer money using mobile wallets. It turns out that among the 68 percent of credit union customers who do not have their own mobile money account, the main barriers are a lack of understanding of the products on the market, and a significant level of mistrust of mobile network operators. Finally, and perhaps most significantly, across the spectrum of potential mobile money applications in people’s daily lives, Haitian credit union customers are very open to the possibility of using mobile money, with the vast majority of those interviewed expressing openness to using their mobile phones for a variety of financial transaction applications. Overall, we realized that attitudes toward such platforms are generally very positive and people are explicitly open to and often very excited about the prospect of using mobile money for financial transactions to avoid some of the inefficiencies and security concerns of banking in person. These findings point to a conclusion that mobile money as a vehicle for credit union service offerings holds significant potential, but would likely only work with a digital literacy push among credit union customers to ensure that the platforms are used correctly and customers do not become disenchanted. For a more detailed summary of results and an interactive dashboard encompassing all of the data collected during this digital insights exercise, please visit this link for our report and this link for web access to the interactive dashboard.